If Sugar is bad I don’t want to be good..or do I? Sugar sugar sugar, sure we all know it’s not the best thing for us, (and if you don’t please stay under your rock of denial as long as you can,) for the rest of us as long as we drink an extra glass of water, or take the stairs today it can’t be that bad right? Wrong! 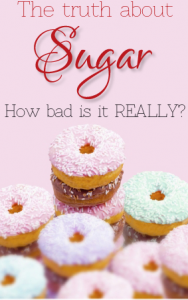 Sadly (for you and me both,) the harmful effects of sugar go way beyond empty calories. Here are the top 5 reasons to avoid sugar as if your life depended on it (and trust me it does). Sugar is half glucose, good, needed by pretty much every cell in the body. Sugar is also half fructose, bad, and unless you are on a treadmill as you read this there is a good chance the fructose from your morning pastry is turning into fat in your liver as we speak. That sneaky fructose! Shocker, something as tasty as chocolate bar has none of the important nutrients I need? Someone please alert the media. We are pretty familiar with the role on insulin; it’s that wonderful little thing that makes eating that extra donut hole possible. The main function of insulin is to drive glucose from the bloodstream into cells. But as with anything (unless you happen to own a Willy Wonka everlasting gobstopper) when we use it too much, it tends to stop working. Cells are no exception, eat too much sugar and cells tend to become resistant to the effects of insulin. And God forbid you don’t enjoy the feeling of a needle (but really who does?) because with type II diabetes chances are you will be administering yourself insulin daily. Oh the joy. Leptin is the hormone responsible for telling your brain to stop eating when it senses we have enough fat (such a beautiful function may I add.) However, the more sugar one eats the more leptin produced and just like with insulin, leptin can stop working properly. Thus your stomach essentially feels like a bottomless pit. And trust me willpower is very weak compared to the leptin-driven starvation signal. Of course I not telling you to go cold-turkey and break up with every good tasting food ever created (because let’s be frank the majority of the best tasting food typically contains sugar, and if you are one of those people who are going to tell me that a piece of broccoli competes with chocolate cake then you ma’am/sir should not be reading this.) I am just telling you that maybe today you drink your coffee a little blacker or eat your cereal a little less sweet. And before you reach for that next sugary treat, think long and hard not about the fat that is will cause (even though for some of you that is enough to make you go running for hills) but instead about sugars long-term cost to your health.